This cake has no fussy frosting to melt or mess up on the way to an outdoor picnic. Instead, it has a delicious, crumbly nut mixture embedded into a fudge-like chocolate marble cake. Let's be honest, it was the promise of it tasting like a hut fudge sundae that really won me over. 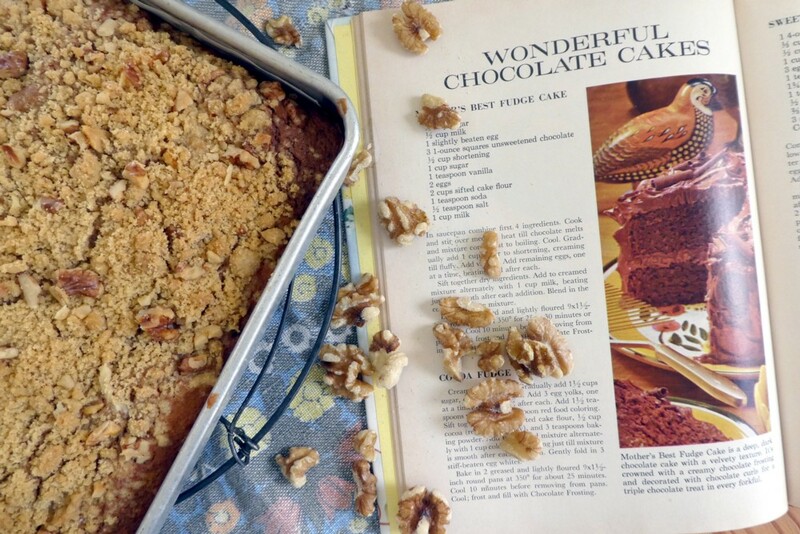 I don't know if that's exactly true, but it's a delicious and easy cake to make - and to carry. This is another recipe from the Better Homes and Gardens Pies and Cakes cook book, this time from the pages of chocolate cakes. It's not a classic chocolate cake though, more like a marble cake, warmed with molten chocolate, brown sugar and nuts. Using the first four ingredients, make your crumble topping. Rub the butter into the flour and sugar and add the chopped nuts. Set aside. Sift the remaining dry ingredients together. Beat in the softened butter, followed by the eggs, buttermilk and vanilla. Beat on a medium speed for two minutes. Combine a cup of your cake batter and the melted cooled chocolate. Alternate the chocolate and plain batter into a lined cake tin. I used a square cake tin but you could also use a lamington tin. Gently sweep through the batters with a knife to create a marbled effect. Be careful not to over mix the two batters - it'll still taste good, but you won't see the marble in the cooked cake. Sprinkle over the crumble and very gently press into the top of the cake batter. Bake for 45mins in a cake tin, or 30mins in a lamington tin. Watch it though. Both times I've cooked from this book, my cooking times have been longer than the book's original 30mins.